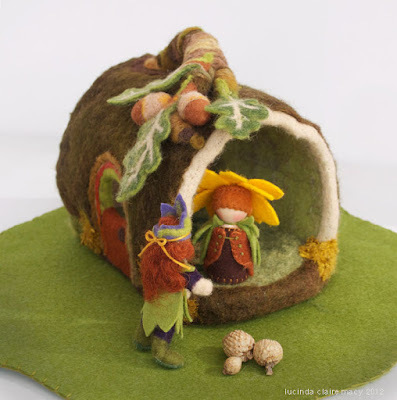 Willodel: Real Log Home made of felt-- a first! Real Log Home made of felt-- a first! I find the felt houses have a wonderful quality of user friendliness. Based on how soft they are to touch and how forgiving they are with a fall or tumble. The color is also rewarding to work with. I have made my first "log home" out of felt. The covering for this is a beautiful piece of hand dyed pre felt from romney wood, beautiful texture and earthy colors. 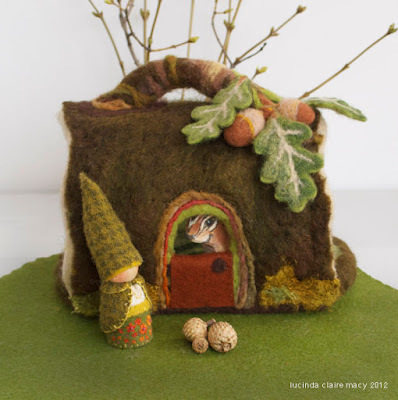 I had the fun of making leaves and acorns too! The leaves I wet felted, the acorns I made from birds nest eggs I had on hand , that I made for a small nest and had turned out too big. So the plan is to keep experimenting and expanding the felt house line. I will be soon making a yurt. Hi Julie! Thanks! I am very excited about the possibility here! oh my! this is so fantastic. you are amazing. i just love coming here to see what you've made.